One of the most convenient features of C# 3.0 is the ability to create new types 'on the fly' using Anonymous Types. Anonymous Types are essentially compiler generated types that you don't explicitly declare with an official type declaration. Rather you define the type inline as part of the code where you need to use the new type. Furthermore when the type is 'announced' you don't have to explicitly type each of the members that you create on the type due to the new inferred type discovery that's also new in C# 3.0. This code creates a new instance of an anonymous type - in this case a simple object instance that holds customer data. Once you have declared the type like the above you can then use the type as if there was a full type declaration, so you can access Customer.Company, Customer.BillRate and so forth. Notice that the C# compiler fixes up any members that are created and assigns an appropriate type to each. So as you can see in the screenshot BillRate is typed as decimal based on the inferred type which in this case is a literal decimal value. So Company is a string and Entered a DateTime member by the same logic. Type inference is not limited to literal values - so any typed value expression can be used as an input to force the type to be created. As long as the compiler can tell what the base value is the member can be created as a specific type. Notice the Contacts member which is another anonymous type nested inside the first type. One very important aspect to understand about anonymous types is that they are a compiler generated construct. The type is a regular .NET type similar to any other but it has one big limitation: Anonymous types are scoped only to the currently executing method. Because the generated type is anonymous there's no public name for the type that you can access. In other words you can't instantiate the type directly on your own and you can't reference the type outside of the method that created it. Notice that the type was created using type inference using the var keyword. Within the local method scope the compiler understands all the type semantics of the type so you get strongly typed access to the type including Intellisense. However, if you plan on creating an anonymous type and then pass it out of the local method scope you end up loosing the type information, because the type is unknown outside of the method that created it. The only way to return an Anonymous type from a method is to return it as type Object, and the only way to access the type members there is through Reflection. There's no way to return var as a result type, so a generic object is all that you can return. Any calling code can then only access the type using Reflection. Sometimes this might work OK - for example using DataBinding which often uses Reflection anyway on objects - but at other times you have to be careful with these types as they become unwieldy to use externally. If you use Reflector to trace back the type reference you can see that indeed only one type was created in the - namespace. The - namespace is the 'generated' namespace that .NET uses internally (another place is for ASP.NET stock project page files which also use this namespacing). Also notice that the anonymous type is created with READ ONLY Properties. This means that you can create the anonymous type but you can't assign values to it after creation and that any assignment of the type has to always be made as part of the anonymous type declaration. This seems a bit of an odd design choice frankly, but then again if you don't need to create the type and its values on the fly it's probably better to create an explicit type anyway. Personally I think if you can it usually pays to be to explicit with types since you get a type that is reusable and can be passed around more easily. Use of anonymous types usually works best for some sort of final projection or message scenario where the projected type is in effect the final end result that will be iterated over and displayed or passed over the wire with some sort of serialization. You may look at the above code and go "yeah so what?" and wonder about some of the limitations of anonymous types. Also, realistically there's nothing happening here that you can't do by hand. If you really look at this from a plain language perspective the anonymous type just creates a type and initializes it for you with the data assigned to the members. You are in fact creating an IQueryable<AnonymousType> which can then be turned into something like a List<AnonymousType>. 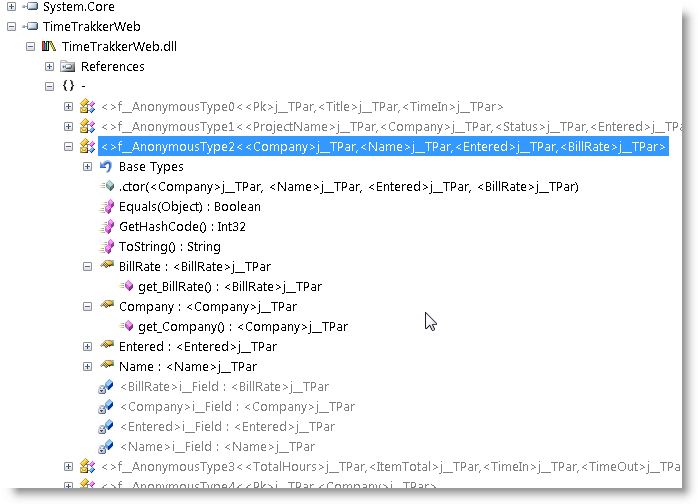 The fact that an anonymous type can be created on the fly and that it can be done in a single line of code makes it possible for LINQ to utilize this functionality to create custom shaped result types. I've also found Anonymous Types extremely useful for returning result values through serialization and as results for JSON based services. The fact that you can use LINQ to reduce the result data to EXACTLY the set of data that you want to return to a client can be extremely useful especially and HTTP based service scenarios where keeping data on the wire down is useful. For example here's a method that returns custom time and total recalculation data back to a Web page AJAX client which is called rather frequently. /// the calculation of time totals. Rather than passing back a full entity (actually a couple of them) it's much more efficient to shape the result and return exactly the data that the client requires from a callback method via JSON. I suspect there will be lots of new uses for this feature once we've been using it for a while, but I'm already finding it one of the more powerful new tools in .NET 3.5. This is not related to this post. But it would be great if you can (if you have no already) post about using dates. What to store in DB if the date is blank, how to find out and what to display if date is not entered, while creating a row - what to pass, etc. Basically your thoughts and techniques you would use. Kind of reminds me of Pascal Record data types. Nice write up. I think it would be useful if we all started referring to these things as C# 3.0/VB9 features instead of .NET 3.x given that we can use them in .NET 2.0 projects as well. Some of the features (like this one) is available both in VB.NET as well as C#. Where as some of the features like Automatic Properties only is available in C#. Sorry to post off-topic, but: what syntax highlighter do you use? I haven't found a solution that meets my blog's needs and your code samples always look great. @Daniel - isn't that what I did here? <g> Well, we have Microsoft to thank for the runtime confusion that surrounds the new features versions. I sure wish a more sane convention would have been used. Certainly .NET 3.x should have not been a 3.x but 2.5 or something to that effect... too late. Hopefully uptake and installations of 3.5 will happen quickly so in the future we can forget about this versioning madness. Maybe 4.0 will consolidate everything - yeah right. @Rick - LOL.. yeah that's what you did until the last sentence (last word even?) of the post that spoiles it <g>. @yaip - Not a table, but a graphic/slide showing the overlap of each language feature cross C# and VB is on my blog. Hi, can I serialize anonymous Types? @Paul - unfortunately not. All the built in serialization relies on preexisting types to deserialize JSON. Otherwise you'd have to build an object structure on the fly. It might be possible to do something like this in C# 4.0 dynamic types to trap method not found errors and route to a property bag of some sort. "The only way to return an Anonymous type from a method is to return it as type Object, and the only way to access the type members there is through Reflection." I've opened a feature request about this on Microsoft Connect - give your support if you feel it would be useful.